UF 0.25m3 / hr, 0.5m3 / hr, 1m3 / hr, 2m3 / hr, 5m3 / hr, 7m3 / hr, 10m3 and above. 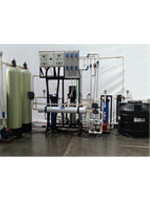 UF Membrane Technology based product. Certified by Laboratories of National Repute for removal of Bacteria (E-Coli) and Viruses (Hepatitis 'A' & 'E') responsible for water borne diseases. 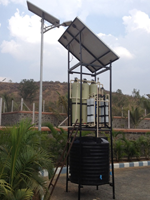 Cost effective solutions for treating ground water using innovative technologies & avail safe drinking water. 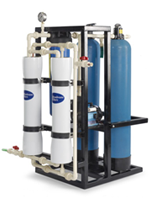 Stand Alone Systems directly connected to ground water source. 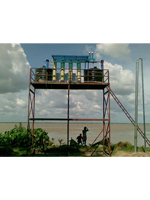 In recent years, the increasing threat to groundwater quality has become a matter of great concern. A vast majority of groundwater quality problems present today are caused by contamination such as Iron, Arsenic & Fluorides. In many of these areas groundwater is only source of drinking water, thus a large population is exposed to risk of consuming contaminated water.High iron levels in groundwater are widely reported & Inorganic constituents of significant risk to health that occurs in groundwater has been studied in recent years of research. 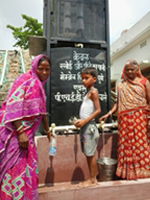 One such constituents such as Iron is reported in many villages in the State of Bihar and widely spread in Northern part so also along the Kosi basin and significantly noticed in more than 9 districts such as Begusarai, Khagaria, Saharsa, Purnea, Kisanganj, Madhepura, Araria, Supaul & Katihar etc. 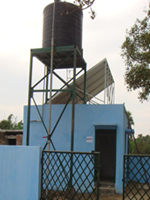 Pratibha – Membrane Filters a Joint Venture who has expertise undertook the responsibility to work on removal of such Iron Contamination from ground water. Right from the stage of identifying the land with the help of local Government authorities, digging the Bore well, running the entire submersible pumping system by using solar power started the challenging work of working in 500 villages and started installing Iron Removal Treatment Plants that has been specially designed using the latest state of the art technology followed by Ultra Filtration and reaching such processed water to the villagers in remotest part of Bihar. 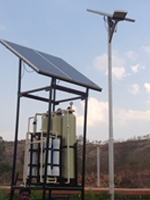 The Technology so complex yet made very simple to operate has been one of the key features of the project. 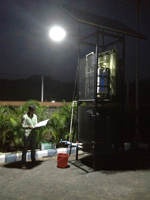 Moving from place to place, engaging civil Engineering techniques and Project Management specialization has made this possible to execute such a herculean task of installing such plants that now benefit over million inhabitants in the country side villages. 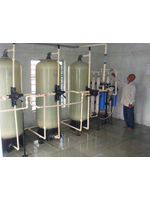 Granular filter media a specially engineered product to remove Dissolved Iron in an efficient, safe and cost - effective manner from Ground Water is used. 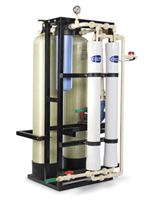 Filter media is used in either gravity fed or pressurized water treatment systems & acts as an insoluble catalyst to enhance the reaction between dissolved oxygen and the iron / Mn compounds. Dissolved Iron is usually in the ferrous bicarbonate or Fe (II) state due to excess of free carbon dioxide and is not filterable. The Media acting as a catalyst between oxygen and soluble iron compounds enhances the oxidation reaction and produces ferric hydroxide or Fe (III), state which is insoluble and precipitates. Ferric hydroxide precipitate is easily be filtered. The physical characteristics of this media provide an excellent filter media & are easily cleaned by backwashing to remove the precipitant. 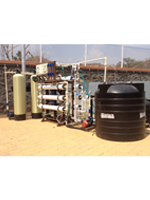 Thus treated water then passes through indigenously manufactured Ultra Filtration membrane, licensed from CSIR/ NCL a prestigious laboratory of Govt. 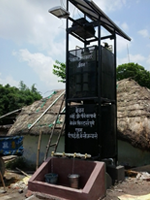 of India thus making water totally safe & pure for drinking. Then it is stored in 5000 litters’ over head tank till it is distributed to the villagers through specially laid down pipelines and availed through 22 such stand posts. Once the plant is installed, erected, the local representatives who also work as guards of such plant are well trained to run such plants. 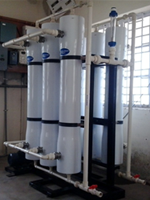 The Project Management Company Pratibha – Membrane Filters Organization also works with their research wing and has specially designed and engineered the plants to handle complex in organics such as Arsenic and Fluorides. Thus has made the Drinking water Affordable, Accessible & now made Available to a common man in the state of Bihar and now poised to spread its wings across all such States where problem with such undesirable In organics such as Iron, Arsenic and Fluoride are faced. 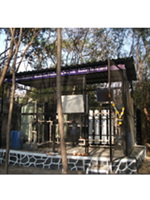 UFRO 0.25m3 / hr, 0.5m3 / hr, 1m3 / hr, 2m3 / hr, 5m3 / hr, 7m3 / hr, 10m3 and above.